If you're planning on going to Ippudo after 6pm, expect at least a two hours wait for a table. Don't bother trying to make a reservation ahead of time, they don't take any. So if you're really looking forward to this place, make sure you're wearing comfortable shoes and get ready to throw back a few orders of beer and sake, because it's gonna be a while. Why people are willing to wait hours to pay $14 for a bowl of ramen when the average price is $10 is beyond me. 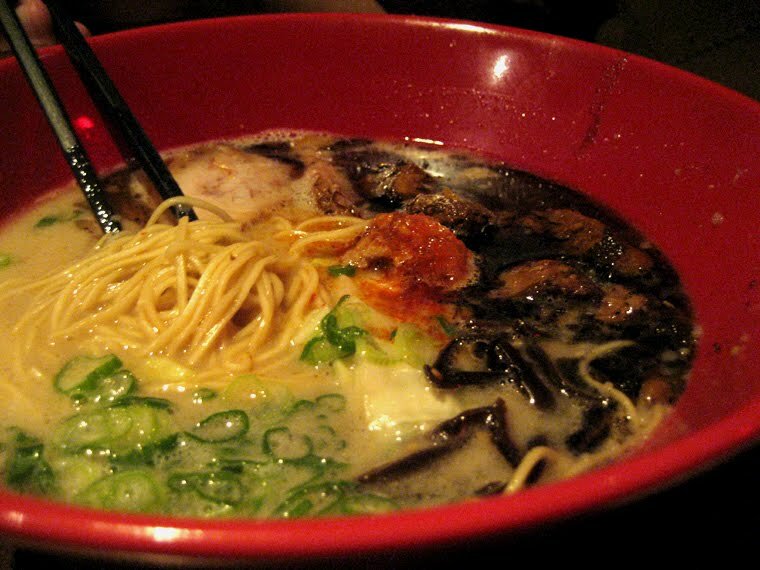 In terms of both broth and texture of the noodles, their ramen does not exceed the standard characteristics of what ramen should be. Ippudo has the traditional pork, egg, and bamboo shoots in their shoyu ramen. It's fair to say that most ramen places consists of the same ingredients. The distinction of a good bowl of ramen should be their broth and noodles. The broth should be flavorful and the noodles fresh. How other ramen places such as Rai Rai Ken and Setagaya stand up to Ippudo is debatable. It seems like everyone has their own favorite ramen place to go to. Other than the fact that Ippudo offers refill on noodles for an extra $2, I just don't see what it is that makes this place stand out. Some of the best and most renowned ramen places I've been to was in Tokyo. I must admit I haven't tried Fujimaki's reputed and infamous ramen for $100 USD yet, but don't count on it because I don't plan to. To say Ippudo is overrated sounds cliched but the exposure they're getting seems undeserved. The value that you get for the price that you're paying just isn't worth it. And it looks like the attention that they're getting is going straight to their heads. Has a hostess ever rolled her eyes at you when you asked to see their menu? It seems like that's the kind of attitude you'll be receiving at any over-hyped, non-Michelin rated restaurant. Don't buy into the hype. Take your money and go spend it elsewhere.